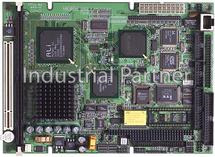 The PCM-5896 is an all-in-one multi-media Pentium processor based single board computer (SBC) with a 32-bit PCI audio controller, a PCI Flat Panel controller, a PCI 10/100Base-T Ethernet interface, and one PCI expansion slot. With 100MHz system bus, the PCM-5896 achieves outstanding performance that surpasses any other SBC in its class. In addition, the onboard SSD interface supports M-systems DiskOnChip 2000 series, memory capacity from 2 MB to 1GB. This compact (only 5.75" x 8") unit offers all the functions of a single board industrial computer, but still fits in the space of a CD-ROM drive. On-board features include four serial ports (three RS-232, one RS- 232/422/485), one multi-mode parallel (ECP/EPP/SPP) port, connector for two USB (Universal Serial Bus) ports, a floppy drive controller, and a keyboard/PS/2 mouse interface. The built-in high speed PCI IDE controller supports Ultra DMA/33 mode. Up to two IDE devices can be connected, including large hard disks, CDROM drives, and tape backup drives, etc. The PCM-5896 also features power management to minimize power consumption. It complies with the ACPI standard and supports three types of power saving features: Doze mode, Standby mode, and Suspend mode. In addition, the board's watchdog timer can automatically reset the system or generate an interrupt in case the system stops due to a program bug or EMI.